Waveonics’ first day at the New England Boat Show in Boston, MA was on Saturday, February 14th, 2015. This was our first appearance at a convention of this size. It was an eventful day for us, but a lot of fun. Members of our team were able to spread the news about Wayves to the public in a few ways. We started by speaking with potential users personally, and then participated in a radio interview. We were both honored and pleasantly surprised when we were approached by Captain Lou from the radio station WATD 95.9 FM. He is the host of a show called Nautical Talk, and he wanted to help us share our vision with his listeners. Captain Lou covers a wide range of boating-related topics on his show. The majority of his listeners are boaters. He thought that Wayves would be a great asset to many them and asked if we would be willing to participate in an interview tho help spread the word. He asked our founder, Blake Nelson, about how our application Wayves works and how it can improve the boating experience. You can catch the live broadcasts of Nautical Talk every Sunday on WATD 95.9 FM from 11:00AM until noon (EST). In case you missed the original airing of the interview, we’re happy to announce that you can still listen to it by clicking play on the mp3 below. You can also find it on the Nautical Talk website! Posted in Recent EventTagged Captain Lou, Interview, Nautical Talk, New England Boat Show, WayvesLeave a Comment on Listen to Our Interview With Captain Lou! 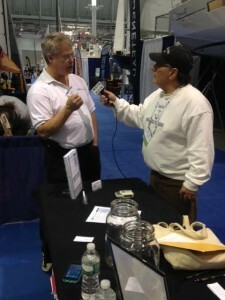 Waveonics is proud to announce that during our first day at the Annual New England Boat Show, an interviewer from the radio station WATD 95.9 FM approached us and asked for an interview. Captain Lou, who hosts WATD’s Nautical Talk program, thought we were doing great work. 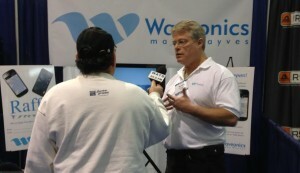 Waveonics founder and Wayves creator Blake Nelson responded to questions about the Wayves program and what it will do for the boating community. We were thrilled when Captain Lou (the host of Nautical Talk) approached us. He wanted to share our app with his listeners in the boating community because he felt that it could greatly improve their experiences on the water. We wholeheartedly agree! The interview will be available this coming Tuesday, February 17th, 2015. If you are unable to attend this year’s New England Boat Show in Boston (taking place February 14th through 22nd), this is a great way to hear about everything we’ve been doing and the upcoming features of Wayves!